THERE was jubilation for Kippax and Sheepscar over the weekend as they booked their places in the Sanford Cup final and LUTY Cup finals, respectively. Goals from Ash Hoddell, Josh Morley and Archie Taylor sealed a regulation 3-0 win for Kippax in their Sanford Cup semi-final against New Armley. Kippax’s opponents in the final will be decided at the weekend as New Pudsey face Hope Inn Whites in the other semi-final, with Hope Inn being the overwhelming favourites to progress. In the LUTY Cup, Bardsey await Sheepscar, who thrashed Temple 4-0 in the remaining semi-final. Daniel Sheriffe continued his imperious form by netting a hat-trick for Sheepscar with Tesfa Walton adding the other goal. In the Jubilee Premier, Hope Inn Whites may already have the title sewn up but they showed no signs of slowing up as they put second-placed Main Line Social to the sword. Danny Maw hit a double with Ashley Westcarr also netting for Hope Inn in a 3-1 win. That result further emphasised Hope Inn’s league dominance this season and their attention will turn to adding cups to their haul. Whites will face Jubilee Premier runners-up Main Line Social in the final of the Leeds & District FA Sunday Senior Cup after Main Line thumped Rodley 10-0 in Thursday night’s first semi-final. Hunslet Club’s Richard Wheelhouse has been fairly quiet in goal-scoring terms this season, but he made up for it over the weekend as he netted seven times in Hunslet’s 10-1 win over Horsforth Saints. Jake Francis, with two, and Killian Mabey rounded off the scoring for Hunslet, who moved up to fourth spot in the Premier Division. Third-placed Rodley maintained their good run of form with a 6-2 win over struggling East End Park. Hat-trick hero Lewis Shanbanjo, Luke Backhouse, Bailey Wright and Ben Carroll were the scorers for Rodley and Thomas Moore notched a brace for East End Park. The biggest shock of the weekend came in Division One where league leaders Bardsey were hammered 5-0 by True Brit. Jamie Halsall (2), Ben Jones, Dan Ajibona and Ash Anderson scored the goals for four fourth-placed True Brit. Despite that disappointing result, Bardsey remain well clear of second-placed Kirkstall Crusaders Academy, who secured a narrow win over Oulton Athletic. Phil Negelein struck twice for Oulton but two goals from Faisal Sheikh and another from Ryan Wilson swung the game in favour of Kirstall Crusaders Academy. There are now just three points separating second and fourth in the league with many twists and turns to come between now and the end of the season. The last remaining fixture in the Leeds Combination League was the eagerly anticipated game between first and second in Division Two. Going into the game, there was just one point between Rothwell and Old Crooked Clock. 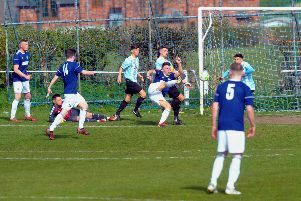 Rothwell knew that a victory would guarantee them the title and they duly obliged, edging out their hosts 2-1 to secure an unassailable four-point lead at the top of the table and the Division Two title.